Are Self-Published Authors Amazon's Guinea Pigs? Does Amazon use self-published authors as guinea pigs to test new ebook marketing ideas? It goes without saying that Amazon was at the very forefront of electronic self-publishing with Kindle Direct Publishing and established themselves as the unrivalled market leader in ebook self-publishing. Over the years, though, I have often had the feeling that Amazon have used their market dominance in self-publishing, and their huge list of self-published ebook titles to conduct market experiments and to pressure other publishers. However, this may not have always been with the best interests of self-published authors in mind. In the early days of self-publishing, Amazon’s success in building a massive self-published Kindle ebook catalogue was instrumental in putting enormous pressure on the big publishers in the early years of the ebook battle and was one of the main reasons why ebook prices fell away so rapidly and dramatically. Then with the introduction of KDP Select, further market pressure was placed on other market players in ebook self-publishing such as Smashwords, B&N, Apple and Kobo, by luring self-published authors away from them, and into total Amazon exclusivity. In my mind, KDP Select was the turning point at which Amazon started to experiment with their huge catalogue of self-published titles, with the very certain aim of increasing their own profit, but perhaps not with the same eagerness to increase self-published authors’ incomes. I can only attest from my own experience and say that my own sales were fantastic before the introduction of KDP Select, but then started to decline about six to nine months after its introduction. Then, with each new feature added such as Prime Lending, Kindle Countdown Deals and Kindle Match, my sales have declined with each new innovation. This is no surprise, as each new feature introduced by Amazon has been targeted at further reducing the price of ebooks, and even making them free. There’s no need to do fancy arithmetic to understand that reducing prices reduces author earnings. And now the latest experiment by Amazon has been Kindle Unlimited, an ebook subscription service, and once again, this has only been available to authors who have enrolled in KDP Select and granted exclusivity to Amazon. 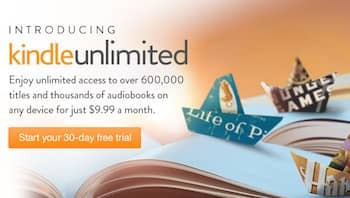 However, after only a few months, there are grumbling noises starting to come from KDP Select authors, as Author Discontent Grows As Kindle Unlimited Enters Its Fifth Month. While there are only handful of reports to date, which actually document dramatic losses in ebook sales, the jury is probably still out on whether Kindle Unlimited has decreased author earnings substantially. But it is sure that Amazon’s Kindle Unlimited is a very real market experiment, which is using self-published authors as guinea pigs. All the while, though, Hachette and Amazon have kissed and made up and are now back in the business of making a profit together. But don’t go searching Kindle Unlimited for Hachette titles. No major publisher in their right mind is going to put their titles into the Kindle Unlimited subscription service. How would they make any money on a $9.99 all you can read deal? That would be one experiment too far. Far better that experiments like this are done on Amazon’s exclusively locked self-published guinea pigs. I have to agree, Jack. But this adventure could turn into a nasty blow. There’s just no way that a $9.99, all you can read subscription will reward authors. No way known. But this is where ebooks are heading, and if music is any guide, it’s going to be a killer blow for writers. Look at Taylor Swift withdrawing all her music from Spotify, and btw, I don’t blame her at all. I think more musicians should do the same. You could blame Amazon and Spotify and alike, but in the end, it’s the miserable consumer who wants everything for bloody nothing, who is to blame. The Internet has bred a value system that is thoughtless and mindless – “I’ll have it so long as it’s free or cheap”. My only response is to take away my products that have taken months and years to produce. Stuff them. But there will always be more fools, who will take my place. While I agree with you Derek. Were we to pull our books, would anyone care? I hate the all you can read for $9.99 deal as much as you do. Back in 2012, I read the contract, saw the demand for exclusivity, and refused the “offer.” Can this mean that I’m the only Indie who never signed up? There have to be others out there who didn’t take the bait. How can I find them? I’d like to know who else may have “suffered the consequences” for having had the cheek to say “no” to the big fella. This is a great site for catching up to date, unbiased publishing news. I’m twice trad published but decided to go self-published for the third book. Many times I’ve thought, why bother with all this? I’m 62 and I’ve seen publishing change so much since I started out with my business books in 1989. It’s dire. So much is dependent on our love of writing and willingness to do it for virtually no financial reward, relying solely on more altruistic reasons.